At Nakamura-ke in Kitanakagusuku Village, Masaru Tanaka presented a paper craft model of Nakamura-ke to the owner Kunihiro Nakamura (left). 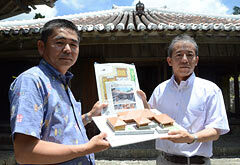 Masaru Tanaka, professor of Yamanashi University Graduate School, whose area of research is the unique architecture of Okinawa’s housing, has created a paper-craft model of the Nakamura-ke residence, an important national cultural asset located in Kitanakagusuku Village. Children can make the paper-craft model in about three hours using four sheets of paper that have a picture of building on them, plus some scissors and glue. Tanaka hopes the paper-craft model can be used as learning material in schools to teach about architectural structures. Tanaka visited Nakamura-ke and presented ten sets of the paper craft materials to the owner, Kunihiro Nakamura. The paper craft model is one one-hundredth the actual size of the building. The rat guard sections of the tower tank and the animal shed were displayed in three-dimensional form. (220) 8226 or at tanaka@yamanashi.ac.jp by e-mail.